Many drugs and environmental chemicals are capable of evoking some degree of liver injury. The liver represents a primary target for adverse drug reactions due to its central role in biotransformation and excretion of foreign compounds, its portal location within the circulation exposing it to a wide variety of substances, and its anatomic and physiologic structure. 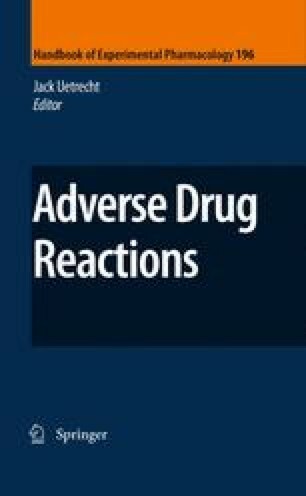 Drug-induced liver injury (DILI) remains the single most common adverse indication leading to drug candidate failure or withdrawal from the market. However, the absolute incidence of DILI is low, and this presents a challenge to mechanistic studies. DILI remains unpredictable making prevention very difficult. In this chapter, we focus on the current understanding of DILI. We begin with an overview regarding the significance and epidemiology of DILI and then examine the clinical presentation and susceptibility factors related to DILI. This is followed by a review of the current literature regarding the proposed pathogenesis of DILI, which involves the participation of a drug, or most often a reactive metabolite of the drug, that either directly affects cellular function or elicits an immune response. It is our hope that this chapter will shed light on the major problems associated with DILI in regards to the pharmaceutical industry, drug regulatory agencies, physicians and pharmacists, and patients.